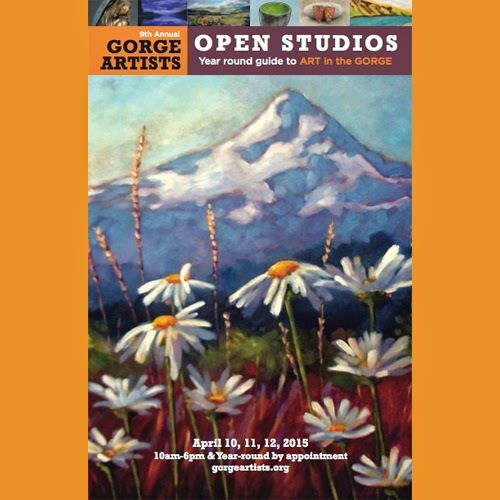 Join the 2015 Gorge Artist Open Studio Tour April 10th through April 12th, 2015. This artist tour is free and allows you to meet 38 artists in their natural habitats. Join this Columbia Gorge getaway for an entire weekend of artistic entertainment. Read details about the 2015 Gorge Artists Open Studios below. Tour the Columbia River Gorge and meet artists in their studios during Blossom Festival. Thirty-eight Gorge artists will open their studios to the public, sharing their thoughts and processes with you. This year’s artists feature works in a variety of media including painting, drawing, jewelry, glass, sculpture, photography, textiles, fiber, and more! Artists’ studios are located throughout the Mid-Columbia from Cascade Locks to The Dalles and from Parkdale, Oregon to Trout Lake, Washington. The tour is free and self- guided, with detailed maps available at www.gorgeartists.org and at area Chambers of Commerce, Columbia Center for the Arts in Hood River, The Dalles Art Center, and Big River Art and Crafts in Goldendale!